The worst cheese and onion pasty I ever had came from Asda. I’ll never forget it. I can’t remember where I’d been that night but I’d been out and decided to pick something up from Asda to eat when I got home. I went to the pasty section, saw one for 30p and thought I’d got myself a bargain. After all, it’s not possible to mess up a pasty is it? Oh yes, Asda sure know how to mess up a pasty. I took one bite, gagged and threw the rest away. It was so wet, I’m sure if I’d squeezed it, a gallon of liquid would have leaked out. Tesco’s pasties are hardly expensive (I think they’re about £1.50 for four) but are a perfectly decent pasty. I’m never getting an Asda one again. At least, not one that only costs 30p, anyway. One year, on holiday in Cornwall, I went to a pasty shop and thought I’d be getting the best cheese and onion pasty ever. I mean, Cornwall’s famous for its pasties, isn’t it, so I was certain that meant any pasty I bought there would be the best ever. It wasn’t. It was nicer than the one from Asda but no better than a Tesco one. Why am I wittering on about pasties? Is there a point to all of this? Well, yes, there is. Yesterday, on Facebook, a friend said she’d settled down to watch television with a cheese and onion pasty. Man, I wanted a pasty then too, but I had no pasties in the freezer and I couldn’t be bothered to walk up to Tesco and buy one. 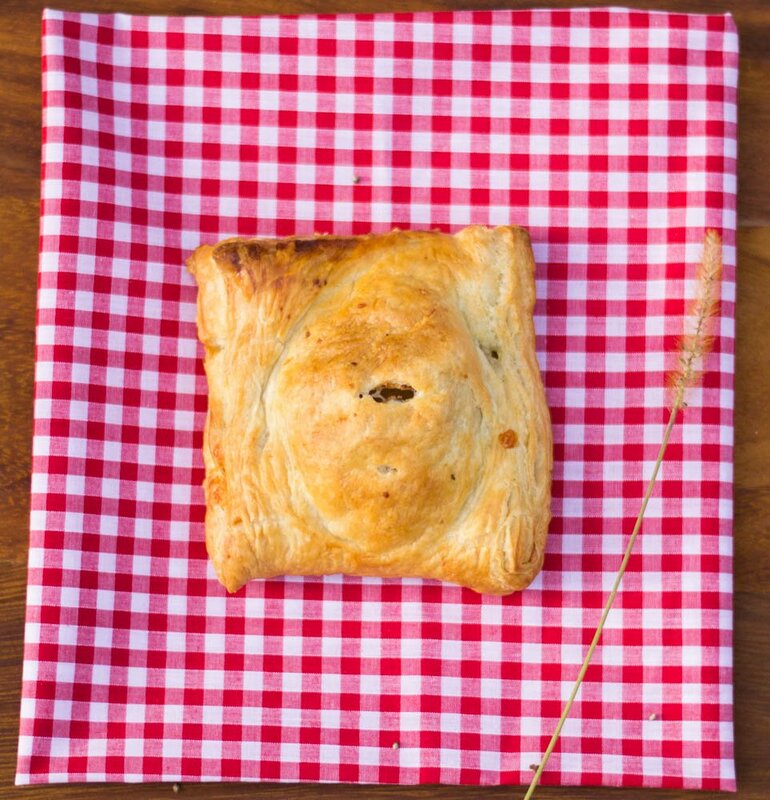 Then I realised I had some puff pastry in the freezer, cheese in the fridge and an onion in the cupboard and although I’d never made a pasty before, I reckoned that’s all I needed to make a pasty. And, do you know what? 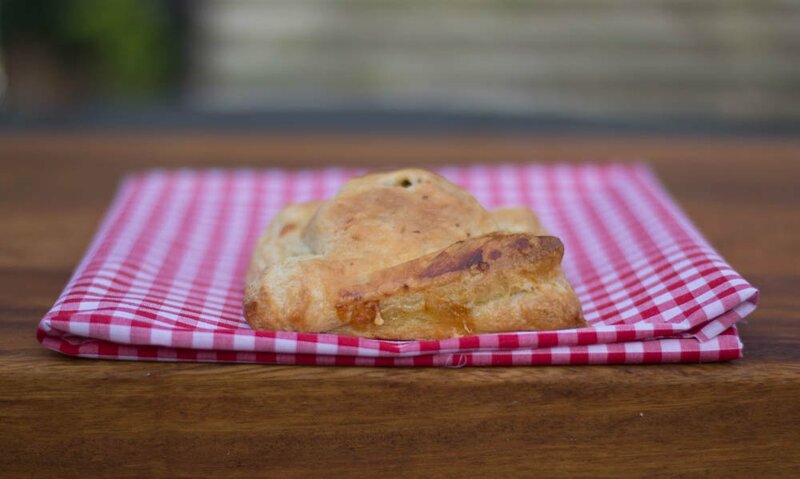 I made the best cheese and onion pasty in the world, ever. It was so simple, I don’t know why I’ve been buying them when I can make one in less time than it would have taken me to go out and buy one. The recipe I’m going to give you is just a rough guide as I just kind of bunged it all together. I had planned to add some sandwich pickle into the pasty but I forgot to put it in. 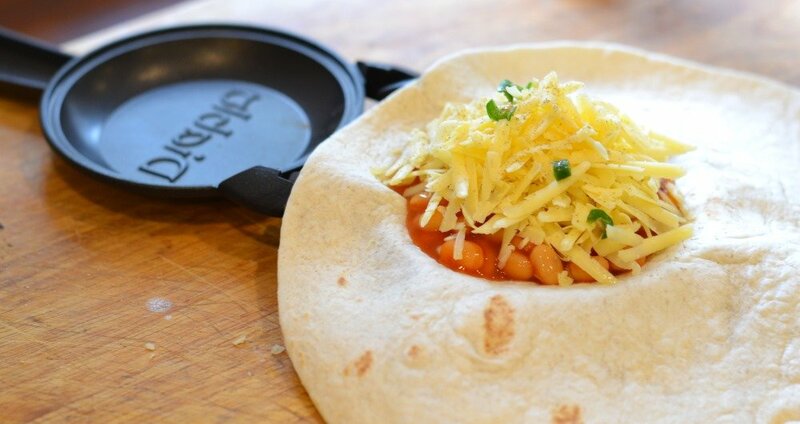 Next time, I’m definitely going to make a cheese and pickle pasty and I might even give it a go in my Diablo Toasted Snack Maker. 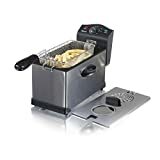 Everyone likes toasted sandwiches but no one likes cleaning the toasted sandwich maker afterwards, so Aerolatte Ltd invented the Diablo toasted snack maker. 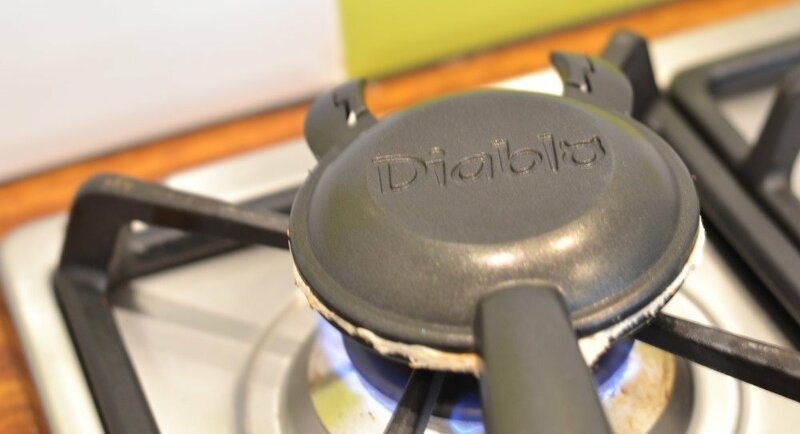 Unlike a traditional sandwich maker, you heat the Diablo on the hob so, as it says on the box – no plugs, no mess, no problem. When I first opened the box, I thought, ‘blimey, that’s small’ and it is small but, as you can see in the photos, it holds a lot of filling. 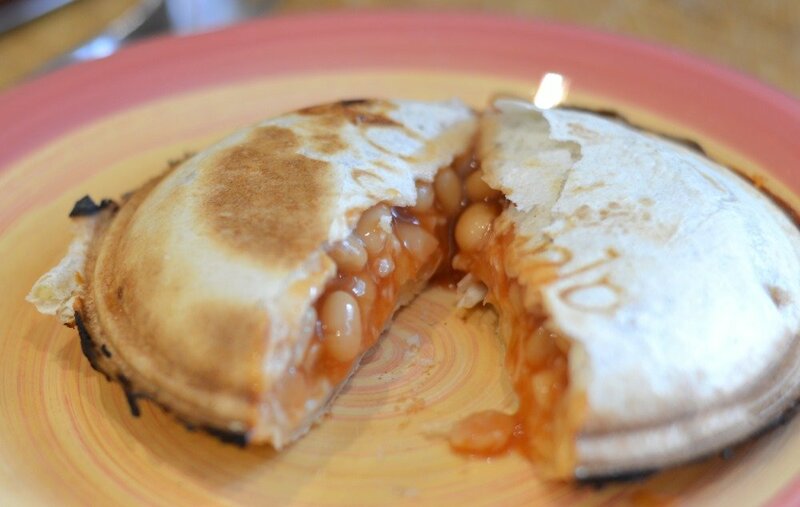 I had planned to make a baked bean and cheese toastie using normal bread but there was none in the freezer, so I used a tortilla wrap instead. I placed the tortilla wrap on one of the Diablo plates (after heating it up first for a couple of minutes), piled my filling on top, then folded the wrap over to make an envelope. I clipped the handle of the Diablo, trimmed off the edges of the wrap and heated it on the hob for a few minutes, turning it over frequently. 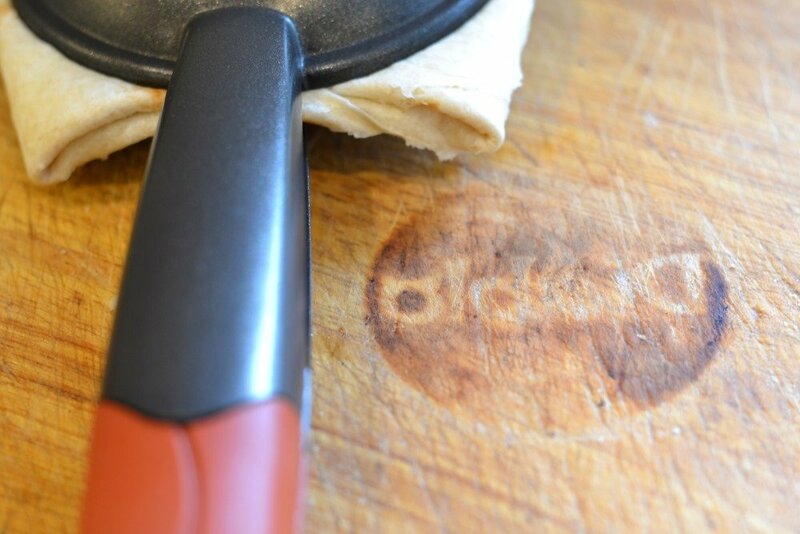 Because I’m a der-brain, I scorched the chopping board by placing the hot Diablo on it after pre-heating it. 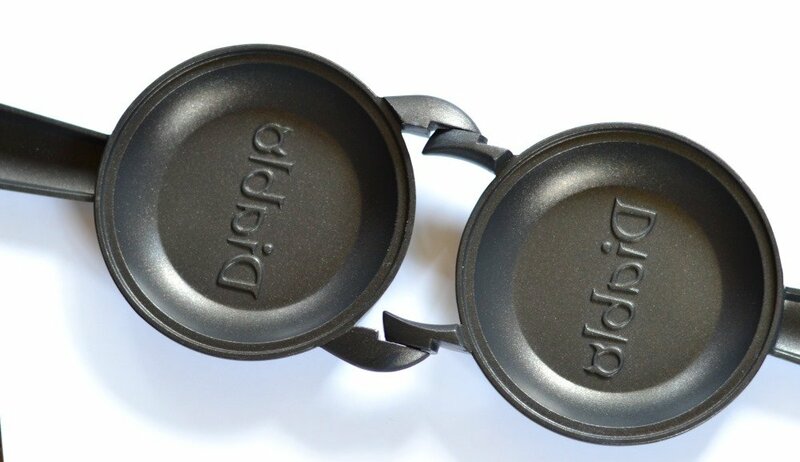 Which isn’t a big deal to me but if you like to keep your chopping board pristine and un-branded, you should probably put the hot Diablo on a trivet or something. 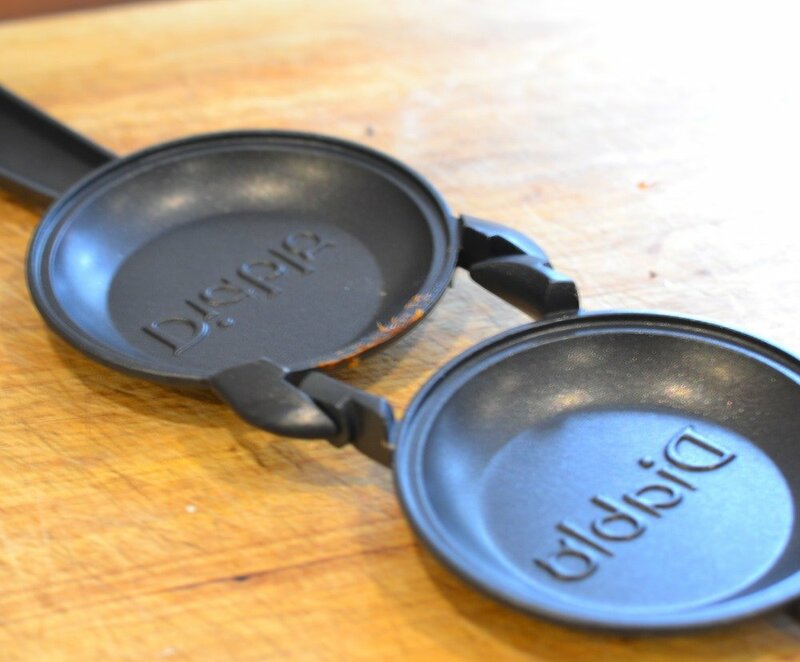 A crispy pie-like sandwich, with sealed edges, slipped out of the Diablo easily, leaving only a tiny amount behind and no mess on the hob. You can unclip the two parts of the Diablo for easier cleaning – either by hand or in the dishwasher. A Diablo makes a great little snack and the filling combinations are endless (you just know I’m going to make a pizza one, don’t you?) You’re not even confined to using it on the hob, as it’d be great for camping or used on a woodburner (which I’m going to be doing). If you’d like more information and to watch a video demonstration, visit the Diablo website. 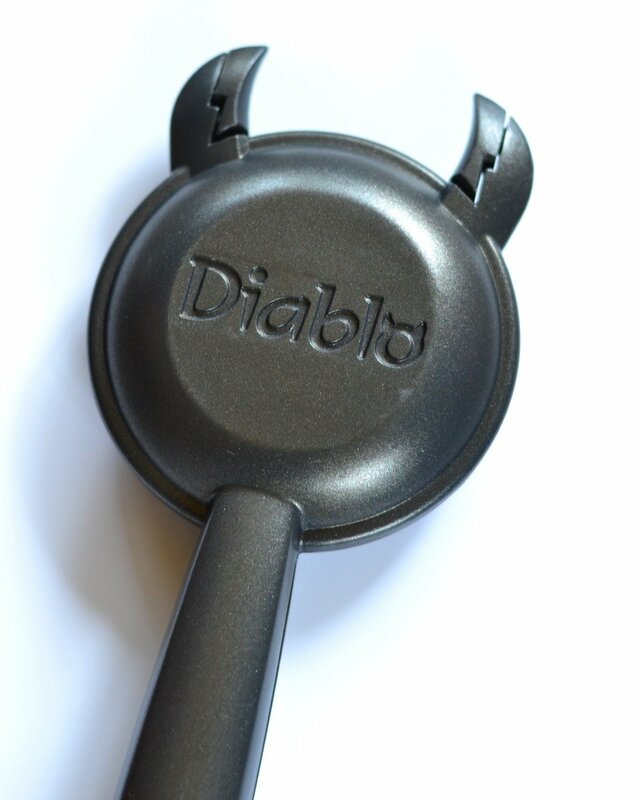 The Diablo is available on Amazon for (at the time of writing) about £13 including delivery. Aerolatte Ltd sent me the Diablo toasted snack maker to review but all opinions (and toasted sandwiches) are my own. I haven’t done any cooking in there for a week or so. Despite the novelty and convenience of having Papa John’s pizza on a Monday night, pre-packaged pasta and couscous salad on Tuesday night and leftover Papa John’s last night, today I craved something not out of a box or a packet, then remembered I had a soup maker somewhere (if you think the kitchen looks bad, you should see the state of the dining room where the floor is covered with the contents of the former kitchen) and looked in the fridge where I found some spinach and carrots. I didn’t take much notice of how much spinach was in the bag or how much water I used, so all weights and measures are approximate. Chuck everything into the soup maker and put on the setting that blends as it goes along. 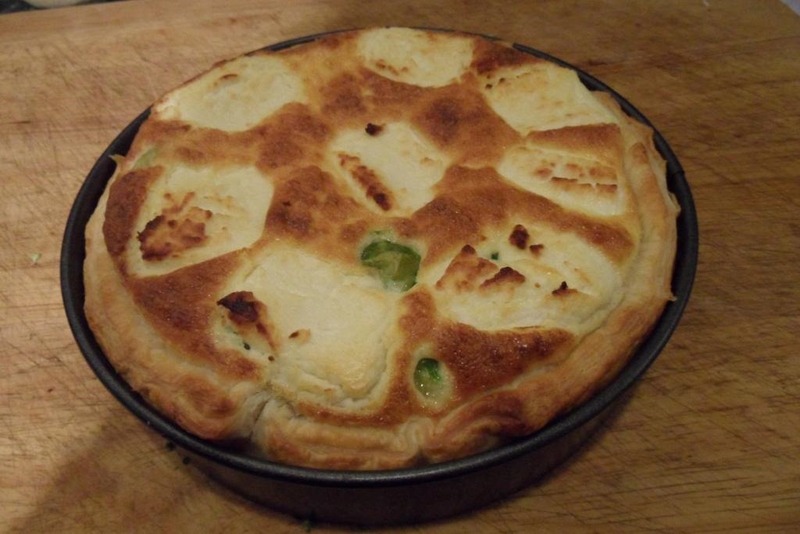 The perfect pie for winter – robust and warming seasonal veg, topped with a puff pastry lid. This recipe is loosely based on one in Veggienomics by Nicola Graimes but I didn’t have any celeriac or carrots (I think *someone* forgot to buy carrots, because I’m sure I put them on the shopping list), didn’t use any cider and Nicola Graimes probably didn’t find her plain flour had gone mouldy and had to use sauce flour instead. 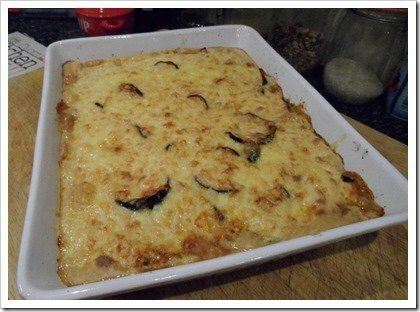 The original recipe also did something complicated with the pastry; the recipe below is my simplified version. Put the turnips and parsnip in a large saucepan and cover with water. Bring to the boil and stir in the bouillon powder. Simmer for about 10 minutes until the vegetables are tender. Strain the vegetables, reserving the water. Meanwhile, melt the butter in a large frying pan and fry the onions for 8 minutes until softened. Add the mushrooms, garlic and herbs and cook for another 5 minutes. 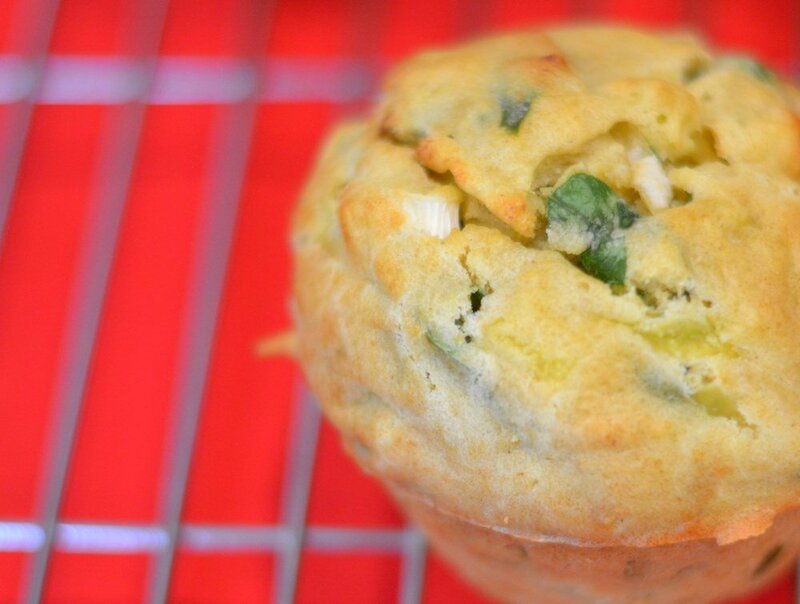 Sprinkle the flour over the top and stir continuously for another minute. 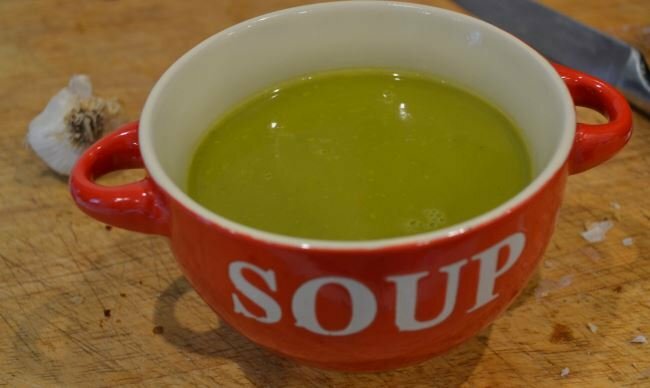 Stir in the stock and cook for 2 minutes until thickened and reduced. Add the cooked root vegetables, 175ml of the reserved water and the mustard and stir until combined. Season the filling with salt and pepper. 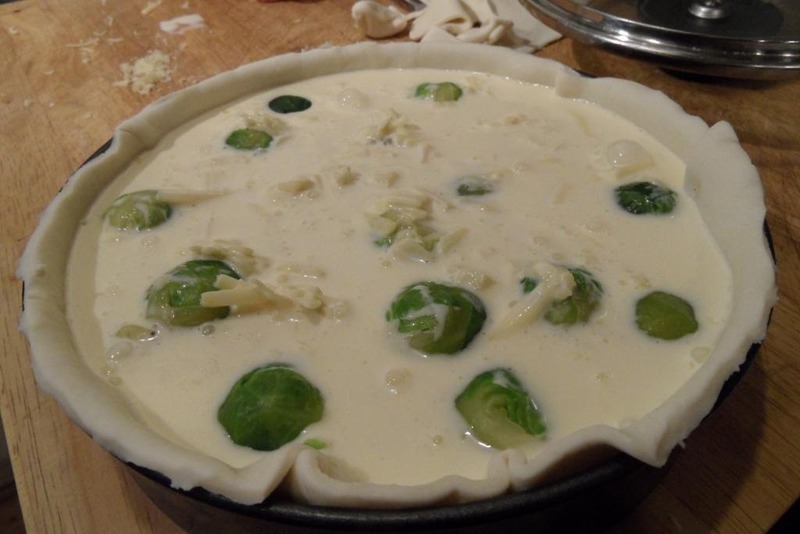 Transfer the root vegetable mixture to a pie dish, stir in the cheese and leave to cool. Preheat the oven to 200C/180 fan/Gas 6. Roll out the pastry until large enough to cover the dish. 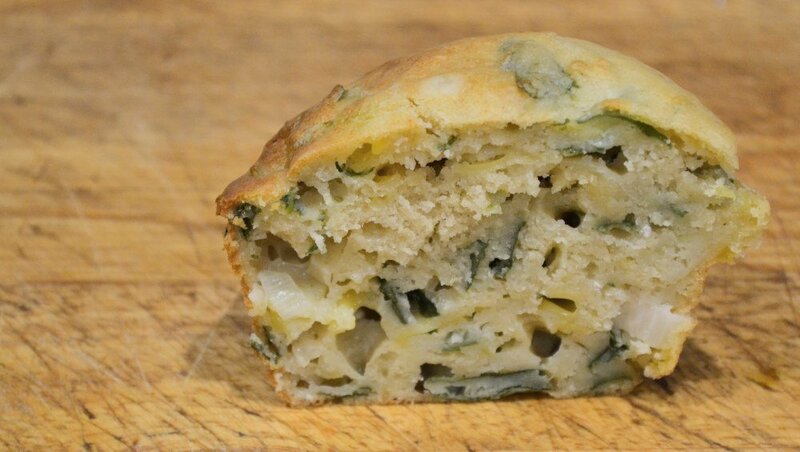 Lay the pastry on top of the vegetable mixture and press down the edges. Prick the top of the pastry with a fork and brush the top with a little milk. Bake for 30 minutes until golden. Cheese on top of a stew? Weird. 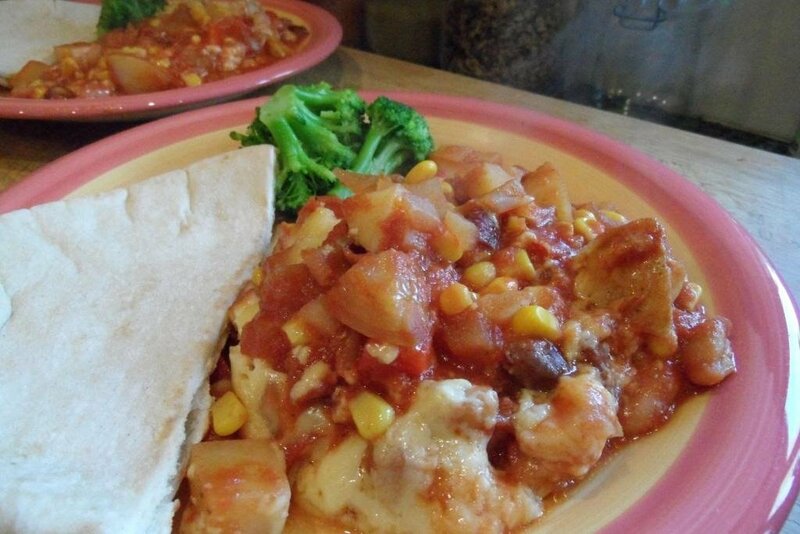 But this is a Mexican-inspired stew and Mexicans put cheese on top of everything, don’t they? Mexican restaurants do anyway which, apart from the silly moustaches which I believe are compulsory to grow, would be a good reason to move to Mexico. If, however, you have no immediate plans to move to Mexico, you could make this stew instead. 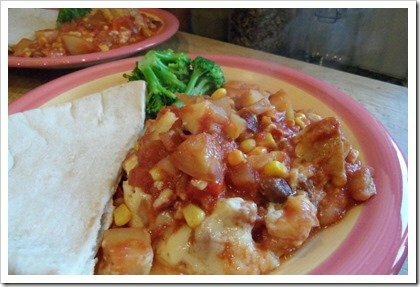 Add all the ingredients to the slow cooker except the cheese. Combine well, then sprinkle the cheese on top. Season, cover and cook on low for 5-6 hours or on high for 3-4 hours. Serve with flat bread/pitta bread and sour cream. The Quorn Kitchen cookbook said the preparation time would be 10 minutes, with the cooking time being 50 minutes. 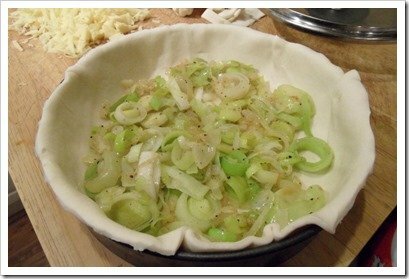 I’ve always thought the preparation time meant the time spent getting the ingredients together, chopping vegetables and getting it ready before it goes in the oven. Oh no, not in this case. 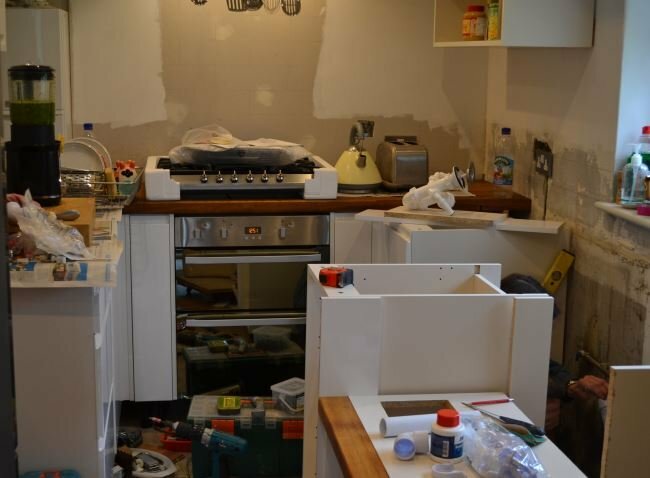 In this case the preparation time was about two weeks. Okay, that might be a slight exaggeration but it was more like 40 minutes, than 10 minutes. When the sauce started to turn a bit brown, panic set in as I thought isn’t evaporated milk used in banoffee pie? Or is that condensed milk? Are they the same thing? Is my moussaka going to taste of banoffee pie? 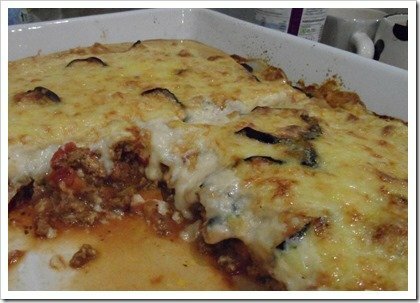 Don’t get me wrong – I love banoffee pie but my culinary tastes don’t stretch as far as some weird moussaka/banoffee combo. Still, it didn’t taste of banoffee pie, it tasted of yum. Filling, too. I’m going to post the recipe as it is in the Quorn Kitchen cookbook, but I left out the lentils, allspice or cinnamon (The Meat Eater doesn’t like cinnamon in savoury dishes – he says it makes everything taste like apple crumble), mint and nutmeg. I also roasted the aubergine slices, not grilled them, as I don’t have a grill the size of a small Welsh village (and I don’t know how to use the grill, anyway). p.s. 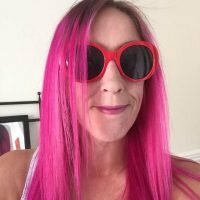 Quorn asked me to be one of their ambassadors, so I’ll also be blogging about Quorn once a month over at my fitness blog. Heat 2 tbsp of the oil in a heavy base saucepan. Add the onion, garlic and carrots and fry for 5 minutes until soft and lightly coloured. Add the Quorn Mince, tomatoes, oregano, allspice or cinnamon, bay leaves and mint. Bring to the boil, reduce the heat, cover and simmer for 10 minutes, stirring occasionally. Season to taste. Brush the aubergine slices on both sides with the remaining oil and grill on both sides until brown. 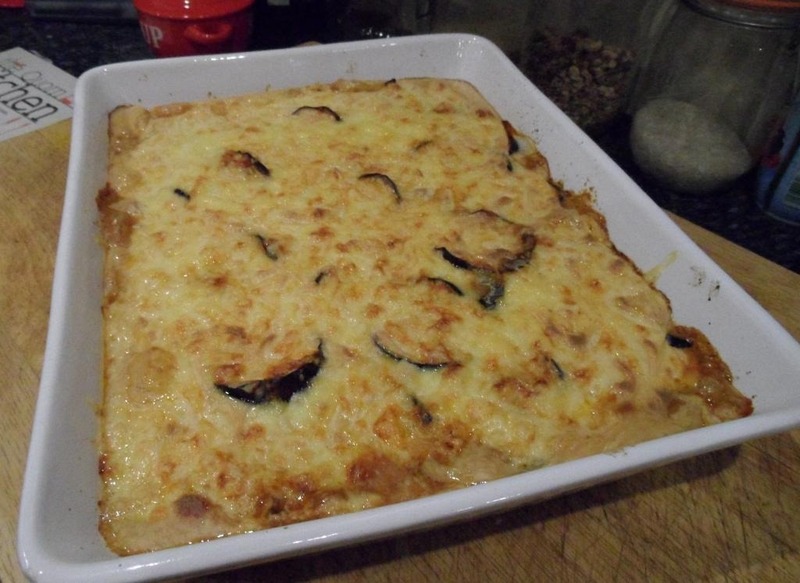 Lay the aubergine slices on absorbent kitchen paper. Set aside. For the sauce, pour the evaporated milk into a measuring jug and make up to 1 litre with water. 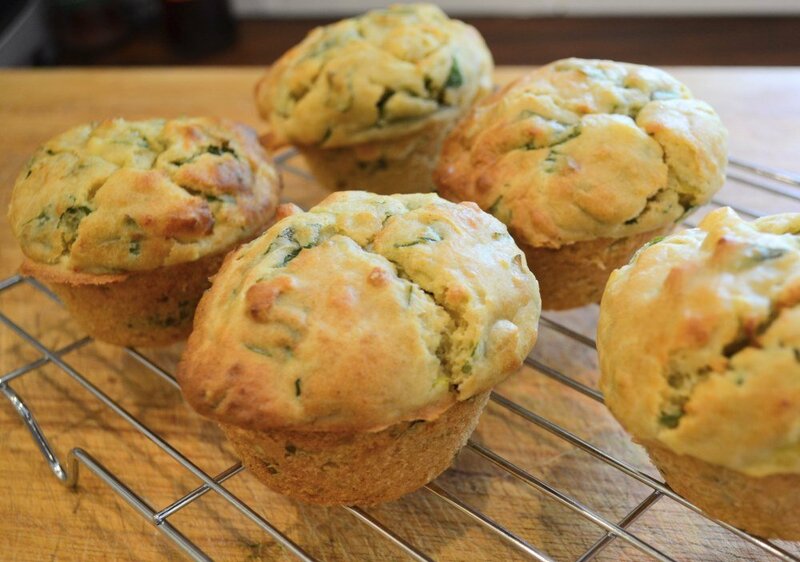 Mix the cornflour to a smooth paste with 6 tbsp of the milk and set aside. 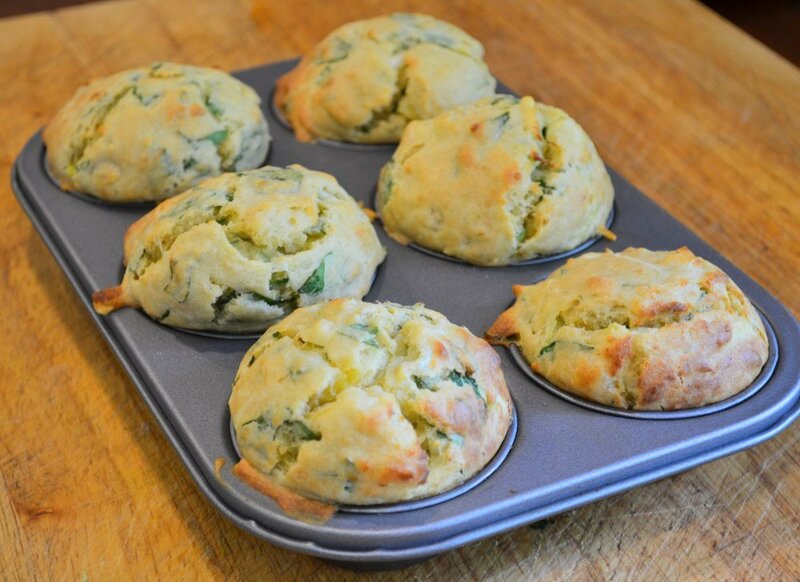 Melt the butter in a saucepan, stir in the plain flour and cook over a low heat for 2 minutes. Gradually blend in the milk and water mix and slowly bring to the boil, stirring constantly. Reduce the heat and simmer for 3 minutes. 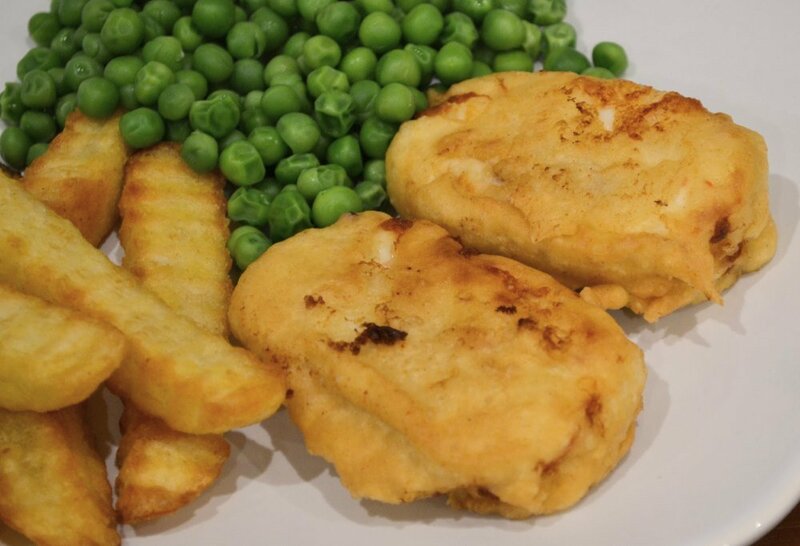 Stir in the cornflour paste and continue to cook over a low heat until the sauce thickens. Remove from the heat and add the nutmeg. Season to taste and stir in the beaten egg. I said the other week, people who put potatoes in the microwave don’t deserve to have a potato in the first place. I still stand by that (even if I am sitting down at the mo) but some sadist scheduled my university timetable to not end on a Tuesday until 7pm, which means I don’t get home ‘til about 8pm and there’s no way I’m going to start cooking then. 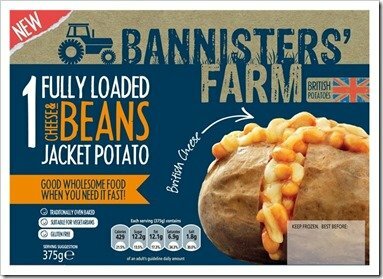 The other Tuesday I got home hungry, had a nose in the freezer and saw a Bannisters’ Farm Fully Loaded Cheese & Beans Jacket Potato. 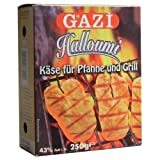 The Meat Eater had one of these the other week and put it in the microwave and said it was just the same as if it’d been in the oven. Hmm, I was sceptical, I can tell you, but it was late, I was hungry and so I popped the potato in the microwave and waited for the ping. I hate to say it, but The Meat Eater was right. This was just as tasty as if it had been cooked in a more traditional way. 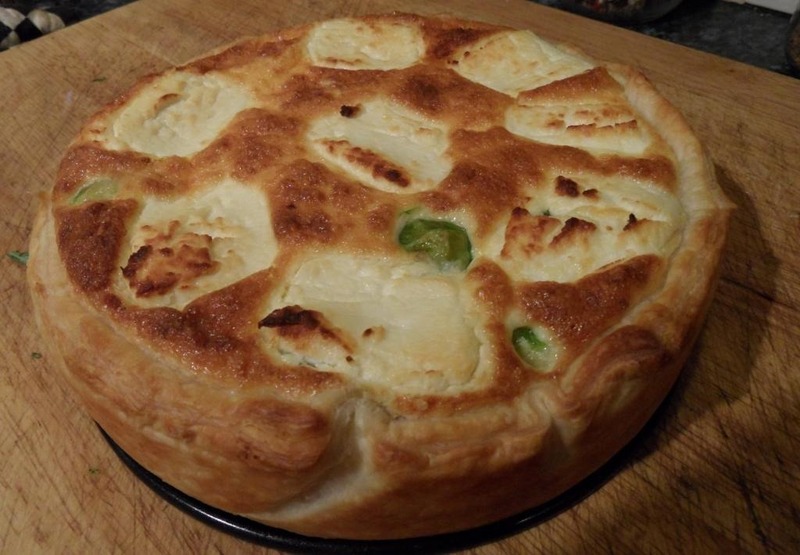 Okay, so the skin wasn’t as crispy as it would be if it’d had two hours at 200C, but it certainly wasn’t soggy and the inside was fluffy and light and there was a generous amount of cheese and beans on top. All in all, a flipping good jacket potato. 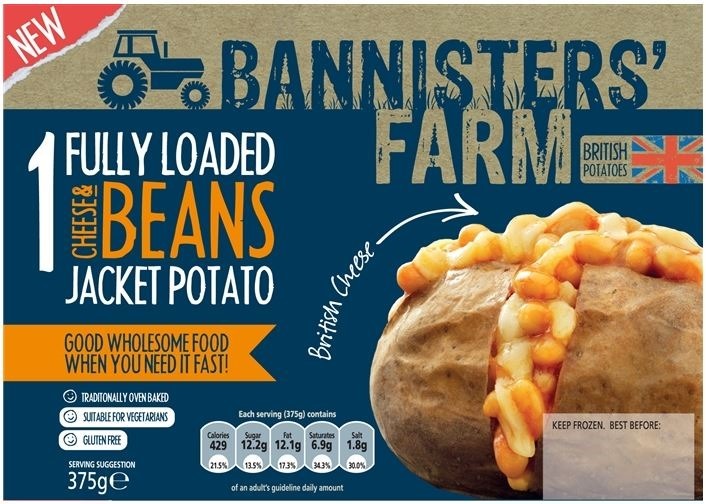 I definitely recommend you get a couple of these to put in your freezer for emergencies (or for whenever you fancy a jacket potato, really), especially as there’s no rubbish in them – it’s just (British) potato, beans and (British) cheese. For more information and to see the rest of the range, visit the Bannisters’ Farm website. 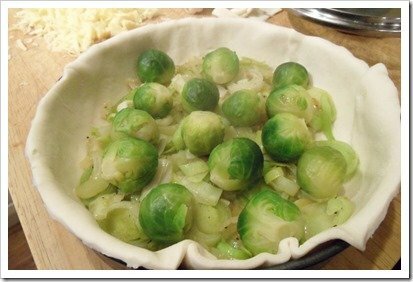 Waitrose asked if I’d like to take part in their Waitrose Christmas Recipe Challenge which involved recreating a traditional vegetarian main dish especially for Christmas. 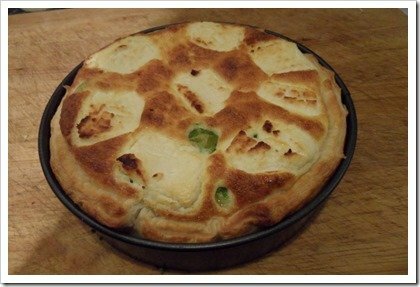 The dish they wanted me to recreate was a vegetable tart. 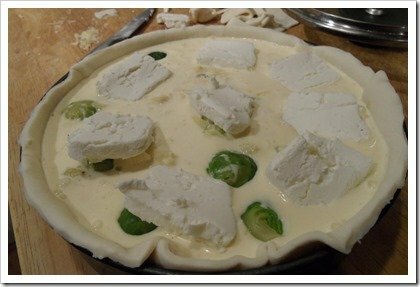 Fine, I thought, that’s easy enough; get some puff pastry, bung some vegetables on it, cover it in cheese and put it in the oven. Sorted. Unfortunately, when I mentioned this to The Meat Eater he started getting adventurous and asked if it’d have cream and eggs in it. Before I realised he was just trying to scupper Vegan Monday, I’d already agreed, despite my reservations that adding cream and eggs to a tart probably makes it less of a tart and more of a quiche. Still, it sounded like a plan, so the only thing left to think of was what vegetables would I use. I thought cranberry and brie sounded nice and Christmassy, The Meat Eater said ‘bleurgh’ (or something like that) and asked for Brussels sprouts. Seriously? 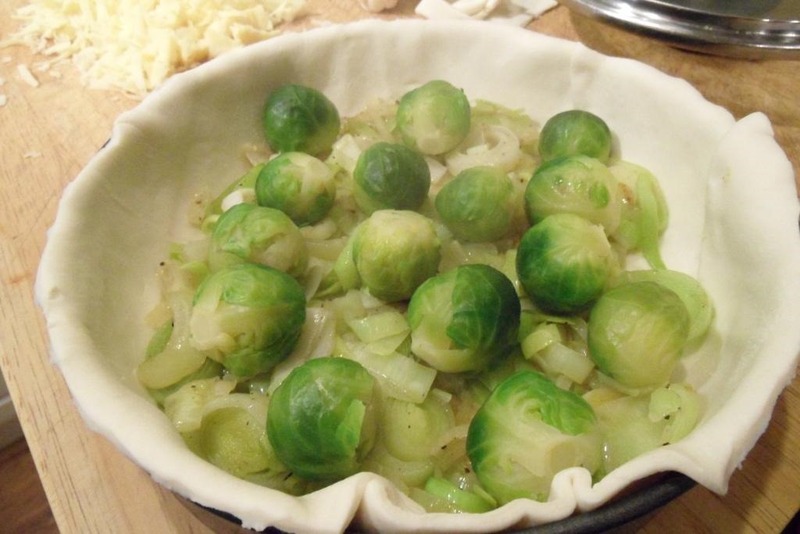 Brussels sprout tart? 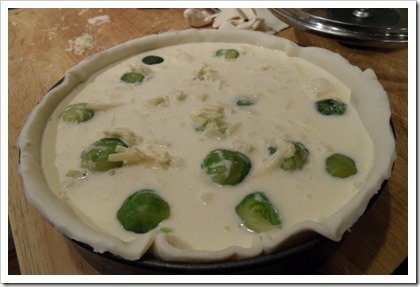 I agreed it at least nodded towards Christmas so I eventually (after asking Facebook what it thought) decided upon Brussels sprouts, leek and goat’s cheese tart (even if it was going to be more of a quiche). I know goat’s cheese is as ubiquitous on the veggie menu as risotto is at Christmas time, but you’ll have to forgive me for this. Trim the ends off the Brussels sprouts, along with any hard leaves and cook in boiling water for 10 minutes. Drain and leave to the side. Fry the baby onions and leeks in the butter for about 5 minutes, until soft and season with salt and pepper. Leave to one side. 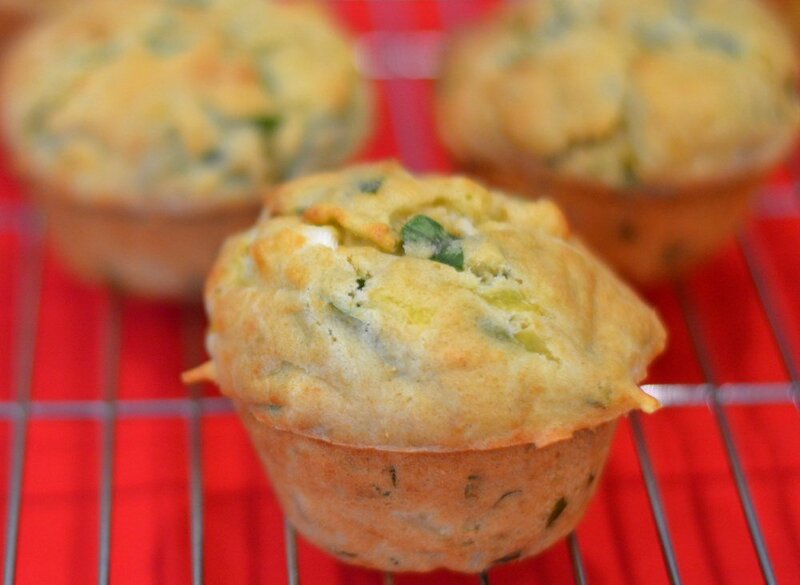 Beat the eggs in a bowl and mix in the cream and grated cheddar. 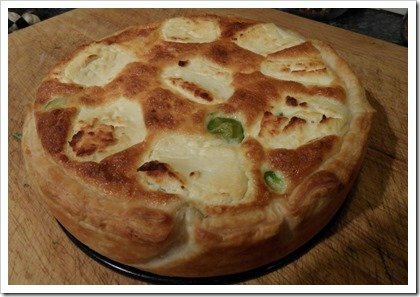 Line an 8” round tin with the puff pastry. 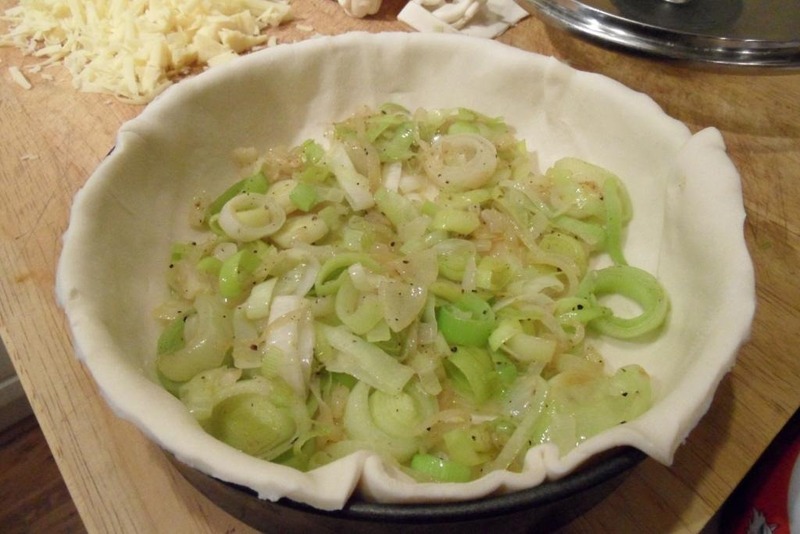 Add the leeks and onion mixture to the tin. Add the Brussels sprouts evenly on top. Pour over the egg, cream and Cheddar mixture. 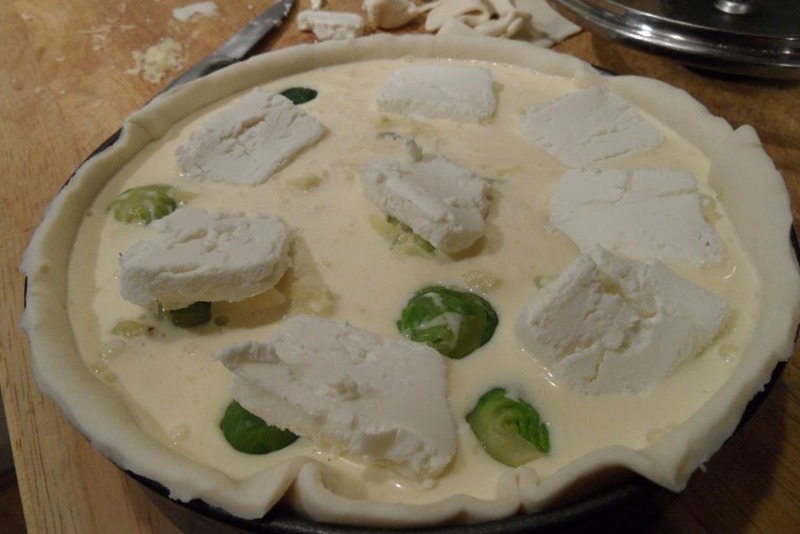 Place the sliced goat’s cheese on top. Bake in the oven for about 30-40 minutes until golden brown, then leave to cool for about 10 minutes to help it set. Probably not the most Christmassy of dishes but, who cares – it was delicious. If you’d like some inspiration for Christmas dishes, have a look at the Waitrose Christmas Page.